The Gibson AJ Advanced Jumbo Guitar is as beautiful today as were the models that were built in 1936 with a sound that has been taking people’s breath away since it was first introduced. A re-creation of one of Gibson’s most famous of guitars, the Advanced Jumbo (AJ) Gibson has a longer scale than the average guitar and a slope-shouldered body that enables even smaller players to play a guitar with a truly large sound, and it’s a sound that will knock you off your feet. 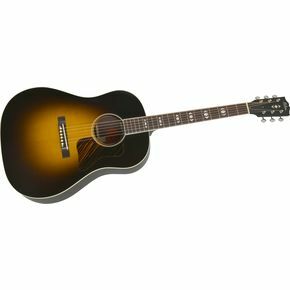 The primary difference between the Gibson J-45 and the Gibson Advanced Jumbo is that the AJ has rosewood back and sides compared to the J-45 which has mahogany. This gives the AJ a much richer sound while retaining the shimmering highs for which Gibson is best known. There is one downside, however, and that is that this particular model seems to need to get used to the player before it truly opens up its true tone. It’s almost as if it adapts to the player and the longer you play it the better its tone and response time becomes. At $2,499 (including the Gibson hardshell case) this is no cheap guitar, but if you look at it as an investment in quality and sound, it doesn’t seem like such a high price after all. See more great guitar reviews at Gibson Acoustic Guitars. Of Couse it's a Good Guitar! Join in and write your own page! It's easy to do. How? Simply click here to return to Gibson Acoustic Guitars.